Here’s a good virtual parlor game. Pick any two or three Twitter users, and Twiangulate which friends or followers they have in common. Twiangulate is a site that shows the overlap between your social graph and any tow other people on Twitter. 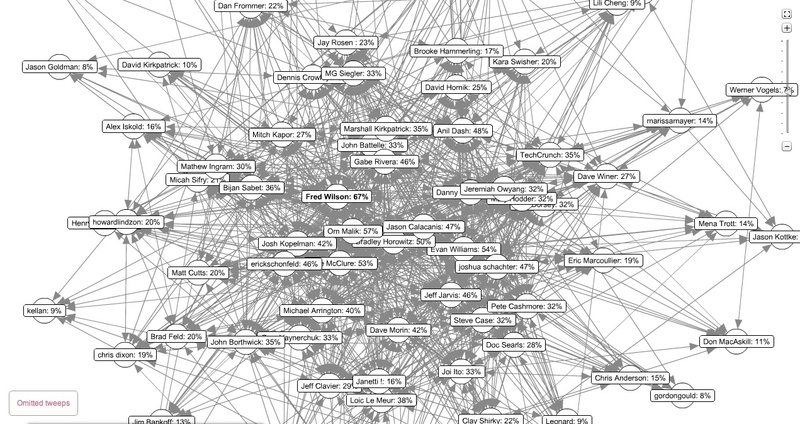 It shows the resulting names as a list or an interactive social map. So who are some of the people Fred, Anil, and I all listen to on Twitter? Some of the common people we follow include Josh Kopelman, Chris Dixon, John Borthwick, Dennis Crowley, Doc Searls, Steve Case, Joshua Schachter, Danny Sullivan, Bradley Horowitz, Michael Arrington, and Jeff Jarvis. Are we listening to the right people or do we suffer from groupthink? Who do you overlap with the most on Twitter?